food hot or cold up to 2 hours. Three layer construction is at the core of this bag: exterior non woven polypropylene, insulating foam, and reflective aluminum lining. This durable bag doubles as a cooler and has many advantages over foam coolers. It’s longer lasting, more ecofriendly, and reusable. Your customers will appreciate this choice. 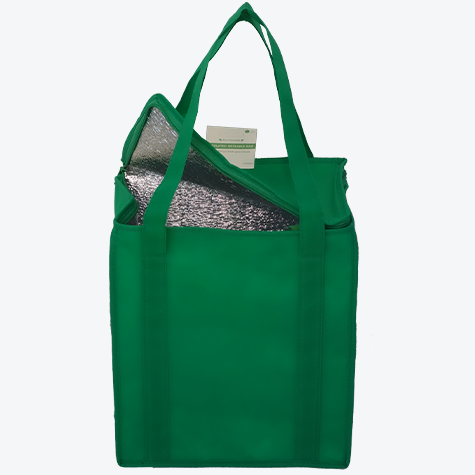 This is our top of the line, eco-friendly insulated grocery bag. It’s store ready to show off your branding, and still has a top that zips around all sides for full closure and to maximize capacity. Your one-color imprint is featured on both front and back. It’s a great bag for keeping food hot or cold for up to 2 hours. These bags arrive folded in a neat rectangular shape with the top flap tucked inside, so they are ready to hang in your store with your branding front and center. When your customer unfolds it, they will find an 8 inch gusset from top to bottom for ice cream, water melon, drinks and other food items that benefit from a little protection on the way home. All our insulated bags feature three layer construction: exterior NWPP, insulating foam, and aluminum interior. For a little lower price, try our Insulated Grocery Square Bag. Or add even more variety at your store and offer our Insulated Lunch Bags. Stores with a wider variety of bags sell more bags overall and customers are happy to find their favorite store offers their favorite style of bag. One bag style simply doesn’t fit the needs of all customers. Let us help you develop the right selection for your store. Contact us today for a quote.